This is where your dream piece of jewelry can come to reality. We consider it an honor and a privilege to have the opportunity of making that special heirloom piece of jewelry for you. Maybe you have seen an Opal available for sale here and want a custom setting made or you have a specific set of requirements and want that brought to life. We would love to help! A Custom Design is something that no one else has. It is thought up in your mind and maybe in drawings on paper based on a mix of pieces you’ve seen or imagined. 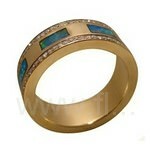 It could even be alterations on an already made piece of jewelry. Whatever your desire, your design or budget, Email your ideas and we will gladly work along with you to bring that special piece to reality. Once initial communication from you has been received with your details in mind, it may take several emails and phone calls before a rough design will be drawn and the finer details worked out. A firm quote will then be given and on your approval, a request for a minimum of 75% deposit will be sent. Once your payment has been received, the first step of making your personalized piece of jewelry will begin using the best craftsman and quality components. CAD image/s will be emailed to you for your approval and on approval, your setting will be crafted and the piece completed before final images emailed to you. An invoice for the final balance (if any) will be sent and on receiving your payment, your one of a kind piece of jewelry will be shipped to you. Be assured that throughout the whole process, you will be communicated with via email and or telephone and any questions you have will be answered promptly. If you have any doubts on the quality and service, read what other Customers have said about Shopping Online at FlashOpal. How long does it take to get to me? Depending on the design you are wanting and how detailed it is, it will take anywhere between one day onwards to discuss your design. From the time of receiving your deposit, the setting will generally take anywhere from approximately 10 days up to 28 days to make. From the time the setting is made, generally around 2-5 days for the final product photos to be emailed. On your approval of these and receiving your balance payment, your Custom Design is shipped to you. Shipping methods and times will vary depending on your country address and more information can be found under Shipping. If your Custom Design is for a specific date, please Contact Us as early as possible and allow a minimum of one month for your Special Design to get to you. Here are some examples of Customers using FlashOpal for their Custom Designs. These products are available to purchase on a ‘Made to Order’ basis. Each product you see in this Category has been sold but the photos give you a very good indication of what your final product will look like. As no two gemstones are exactly the same, and especially so with Opal, the Gemstones will be as close as possible to the original, however, the setting will be the same. How made to order works. Add the item to your shopping cart and proceed to Checkout. In the redemption code box, enter the code MINE which will leave you with a deposit of 50% to pay. Or you can choose to not to enter the code and pay for the item up front. * Enter any special instructions or comments in the comments box and make your payment. You will receive a confirmation email from PayPal and also an email from FlashOpal Genuine Gem Jewelry confirming your deposit, the steps that will be taken to fulfill your order and advising the balance due on completion. If you have not received a confirmation email in your inbox with 24 hours, please check your junk or spam folder or add gg@flashopal.com to your address book. Once your payment has been received, your setting will be made. 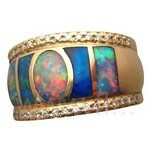 Once the setting is finished, the Opal or Opals will be chosen based on the images of the product you purchased. After the Opal or Opals have been cut, polished and set, photos of your finished piece of jewelry will be emailed to you along with a PayPal money request for the balance due. If you are happy with your order based on the photos, pay your balance and your item will be shipped to you. 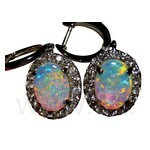 It is important to remember, no two Opals are exactly the same. 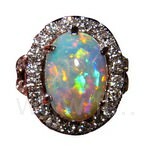 If after viewing the images, you would prefer an Opal removed and replaced with another, all efforts will be made to accommodate your request. However, it will be at the discretion of the maker of your fine piece if it worthy of destroying a rare Natural Gem to replace it with another. Once your payment has been received, your setting will be made and Gemstone Stock will be checked for a match based on the description in the item you have ordered. Once the setting is completed, the Gemstone will be set and photos of your finished piece of jewelry will be emailed to you along with a PayPal money request for the balance due. If you are happy with your order based on the photos, pay your balance and your item will be shipped to you. 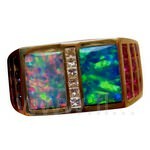 If the Gemstone or Opal is not in stock, it will be sourced from our reputable suppliers. If there is no stock available to match your order, you will be advised immediately and you will have the option of a refund of any monies paid or offered another solution which aims for a positive outcome. It generally takes between 7-14 days for Made to Order products without Diamonds and some Gemstones and generally takes between 14-21 days for Made to Order products with Diamonds and some Gemstones. You will be advised of an APPROXIMATE time frame once your first payment has been received. Once your order has been completed and you have approved the finished product based on the photos, and paid any monies due, your item will be shipped on the next available business day. Shipping methods and times vary depending on your Country and this information is found under Shipping. E.g. A Customer in the USA buying an Opal Gold Ring with No Diamonds or other Gemstones will be looking at APPROXIMATELY 21-28 days from the time of payment in full before receiving the order. This is based on no Customs delays and any other unexpected delays. Most times, orders are fulfilled within this time frame. Please take these times into consideration when purchasing for a special occasion or date. Order early to avoid any disappointment. Conditions of purchasing Made to Order products. *You can choose to pay the full price without using the code. Orders that have all monies paid in full will have precedence over other ‘Made to Order’ orders. If you choose to pay a 50% deposit, you agree to pay the balance of 50% on approval of photos. No Order will be shipped until the full advertised price has been paid. At all times, the full price is agreed upon for any Made to Order product and no discounts will apply. If you have any questions or concerns about purchasing a product Made to Order, Email your inquiry to receive a prompt and friendly reply. Again, thank you for considering FlashOpal Genuine Gem Jewelry for making you something very special.